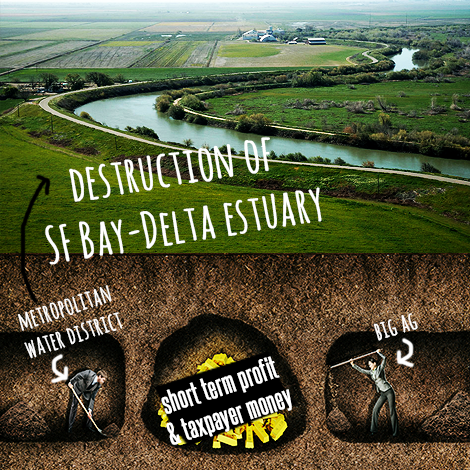 Save the Delta, Stop the Tunnels! The Delta is the largest and most unique estuary on the Pacific Coast of the Americas. Its waters support the largest nursery for California fisheries, the largest Pacific Coast fly over stop for migrating waterfowl, over 500,000 acres of California prime farmland, and an urban community that is home to over 4 million people. 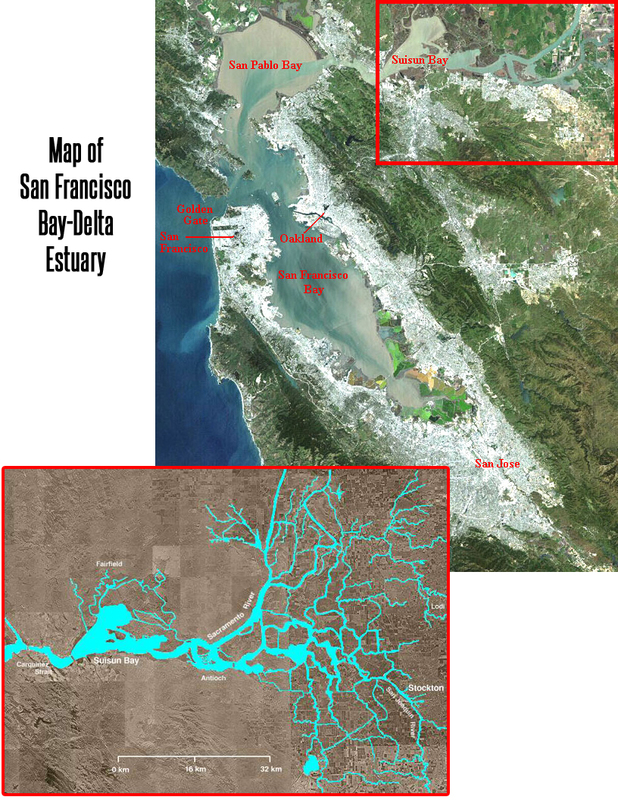 Learn more about the Delta.View map of SF Bay-Delta Estuary. Want to learn more? Chris Austin of Maven’s Notebook covers Understanding the Bay-Delta in 63 photos via KCET. Watch our free award winning documentary Over Troubled Waters narrated by Ed Begley Jr. via Youtube. Here’s a better plan to the Delta Tunnels. Rebutting fast facts about the Delta Tunnels. The tunnels could grab up to 2/3 of the flow of the Sacramento River, which is where the main supply of fresh water in the Delta comes from. Right now, about 30% of water exported from the Delta goes to cities in the Bay Area, the South Coast, and Southern California. In contrast, Big Ag on the west and south side of the San Joaquin Valley, down to Bakersfield, get about 70% of Delta water, which often goes to grow water intensive almonds, cotton, and pistachios on unsustainable ‘desert’ farmland for lucrative overseas exports. In addition, these agricultural users contribute only 0.3% to California’s economy, despite using 70% of Delta water. Learn about who supports the Delta Tunnels and the front group, “Californians for Water Security,” funded by Big Ag. Read our newsletter, The Resnick Farming Story. A recommended story on the most powerful Delta Tunnels proponents: Mother Jones: Meet the California Couple Who Uses More Water Than Every Home in Los Angeles Combined. What happens when you divert the majority of fresh water away from the Delta? Water quality and quantity will deteriorate.The SF Bay-Delta estuary ecosystem and environment will collapse. Fresh water flows are critical to stopping the intrusion of saltwater from the Bay and in flushing out the hundreds of thousands of tons of pollutants and salts that accumulate in the Delta. The science is not there to support the Delta Tunnels. • Hundreds of wildlife & plant species: Without adequate amounts of water, there will be no habitat. Consequently the population of hundreds of species such as the endangered Chinook Salmon and the Greater Sandhill Cranes will become decimated or extinct due to a diminishing food-web. Wildlife, such as the South Pacific Puget Sound Orca Whales, that depend on migrating Delta species will also face near extinction. • Delta & Coastal fisheries: Fisheries are dependent on thriving wildlife. This historic industry is worth billions annually, with the salmon industry worth $1.5 billion annually alone. Thousands of jobs and livelihoods are tied to these industries. Environmental justice communities who depend on subsistence fishing will also face food and health insecurities as a result of increased contaminants and loss in fish and wildlife populations. • Tourism in San Francisco Bay: No analysis has been done on how the lack of fresh water flows will impact San Francisco’s coastal and Pier tourism and recreation. These industries depend on Delta fresh water flows for their crab and salmon fisheries, wildlife sighting, boating, and their restaurant economy. This industry is worth billions annually. • Delta’s $5.2 billion agricultural economy: Farmers cannot irrigate crops with salt water and they certainly cannot plant crops in contaminated soils, which will happen as a result of salinity intrusion. The Delta Ag economy, which consists of generations of family farms and farm workers, will be out of work. • Delta’s $750 million recreation & tourism economy: The operation and construction of the tunnels will obstruct and disable navigable water ways for boating, marinas and other types of leisure activities, in addition to creating conditions of low water flow that will foster invasive aquatic species, such as water hyacinth. Poor water quality also creates unsafe recreation. • Public health of cities & communities in the Delta: Tunnels will cause increased contamination of municipal water, discharge systems and wells for the millions of rural and urban residents living in the five Delta counties. Contra Costa County Water District stated that BDCP failed to model for potential increases of carcinogens and other formation of byproducts that would cause cancer and other serious health effects. Rural towns such as Hood and Byron will have to relocate due to exposure to cancer causing contaminants during construction. If you live in an area that relies on export water, such as in large metropolitan cities such as Los Angeles and San Jose, your water rates or property taxes will go up, but you will get no new water. Rates will rise more for urban ratepayers than for Big Ag because Big Ag does not want to pay as much per unit of water, given the amount of water they need. Government officials say the CA Water Fix tunnels will cost $17 billion for construction, but as with big public infrastructure projects such as the San Francisco-Oakland Bay Bridge and Seattle’s Bertha project (the largest tunnel-boring machine); initial cost estimates always rise enormously. CA Water Fix tunnels cost estimates don’t include bond interest or cost over-runs. A more realistic estimate is over $50-60 billion when interest, administration, research, operation, and maintenance fees are taken into account. If you are a California taxpayer, you will be paying for this project through water bonds. 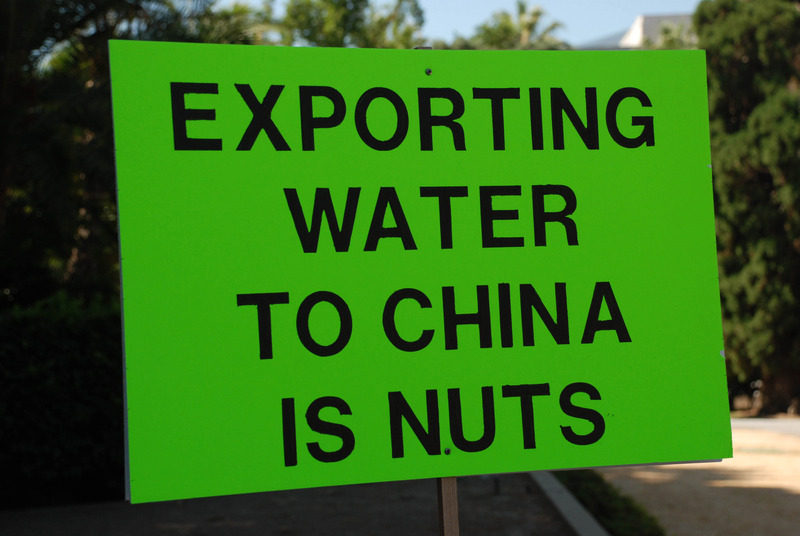 Water exporters do not have to pay for the environmental damage that will result from operation of the tunnels. The State plans to use the 2014 Water Bond (Prop 1) to fund the CA Eco Restore plan to make urban users pay to mitigate damage caused by water exporters. But doesn’t the Delta have problems that need fixing? The Delta has problems, but the “CA Water Fix” tunnels are a 20th century idea that won’t fix them. It won’t produce more water, more reliable supplies, or improved conditions for the environment in the Delta. Click here to see our better solution and our fact sheet addressing earthquake myths. First, get involved with our campaign! Write letters to the editor, make calls to the Governor and your state and federal elected officials, sign up for e-mail alerts from our website, and follow us on social media. You could also make a donation to help our grassroots campaign from our website, by calling our office (209) 475-9550, or by sending a check to 42 N. Sutter Street, Suite 506, Stockton, CA 95202. Get more informed or detailed/technical reports on the tunnels plan by checking out our FAQs & Research section. Looking for yard signs or bumper stickers or campaign materials? Go to our shop!